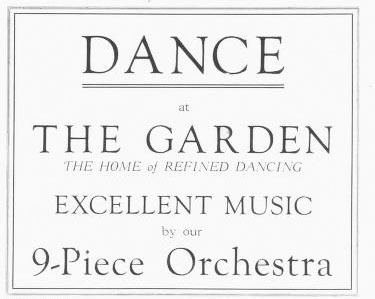 Dance at the Garden. The home of refined dancing. Excellent music by our 9-piece orchestra. Students! 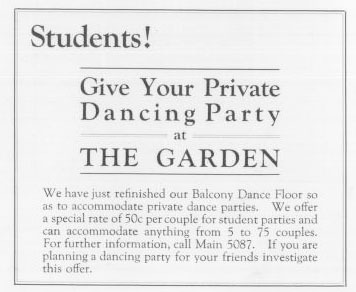 Give your Private Dancing Party at The Garden. We have just refinished our Balcony Dance Floor so as to accommodate private dance parties. We offer a special rate of 50c per couple for student parties and can accommodate anything from 5 to 75 couples. For further information, call Main 5087. If you are planning a dancing party for your friends investigate this offer. Joyous dancing is always a specialty at this beautiful ballroom. 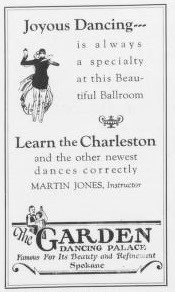 Learn the Charleston and other newest dances correctly. Famous for its beauty and refinement. Dance at the beautiful Garden Dancing Palace. 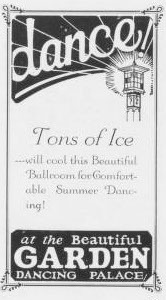 Tons of ice will cool this beautiful ballroom for comfortable summer dancing!